1. Bring 4 cups cider, salt, allspice, and bay leaf to boil in large saucepan, stirring to dissolve salt. Cool completely. Place pork in 13x9x2-inch glass baking dish. Pour brine over. Cover; refrigerate overnight. 2. Melt 2 tablespoons butter in heavy large skillet over medium-low heat. Add leeks; sauté until tender, about 7 minutes. Mix arrowroot with almond milk and mix well. Add to pan and simmer until slightly thickened, about 3 minutes. Season to taste with salt and pepper. 3. Melt remaining 2 tablespoons butter in large iron skillet over medium heat. Add apples and sauté 10 minutes. Add sugar and sauté until apples are golden, about 6 minutes longer. Add stock, then Calvados and remaining 1/4 cup cider. Simmer until liquid thickens slightly and apples are tender, stirring occasionally, about 5 minutes. Set aside. 5. Meanwhile, re-warm leeks, thinning with 1 to 3 tablespoons water if necessary. Bring apples to simmer. Spoon leeks onto plates. 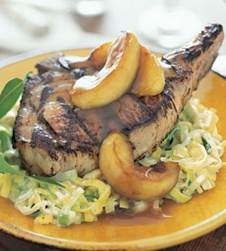 Top with pork, then apples.